A major event in tpm’s calendar each year is Time To Talk Day. And this year was no different. Each year on this day all staff and students are encouraged to put special focus on mental health and wellbeing despite it being a year-round priority for all at tpm. Time to Talk Day, a national event that focuses on awareness of mental health issues, fell on Thursday 7th February this year. However, we dedicated the whole week to the wellbeing both of our students and our staff. Our special thanks for this successful initiative goes to staff member Natalie for her work on promotion and Helen who has become our latest mental health champion. The national theme was bringing together the right ingredients to have a conversation about mental health. The MIND-led charitable organisation, Time To Change, suggested that this could apply to one-to-one chats or a room full of people challenging mental health stigma. Because we all love a cup of tea and a natter we themed our event around having a cuppa. And to get as many of our learners talking as possible of course we threw in some biscuits. Sometimes it is the simple things that make all the difference. The drop-in sessions for tea and a chat were available throughout the week. All students were invited to arrive ten minutes early for teaching sessions. This meant they had time to talk over their free tea and biscuits. The time was used, among other things, to raise awareness of tpm’s mental health champions. 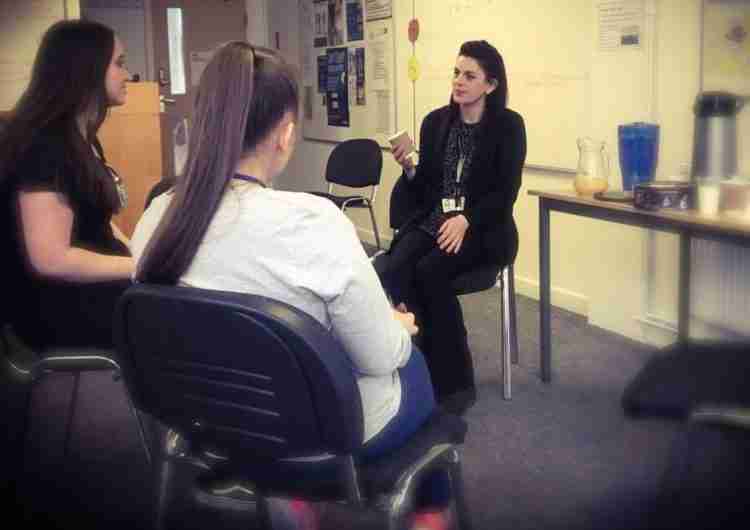 During the week tpm foundation learning teacher Natalie ran a session with traineeship students. Mental health problems affect 1 in 4 people every year. Time To Talk operates on the basis that no one should feel ashamed. They promote sharing experiences as a way to end the stigma. Be honest about your own situation. Everybody has mental health, good or bad. Even with a healthy mind it’s good to talk about stresses and be open to hearing other people’s stories. Listening is key. Give time to really hear what someone else is telling you. A safe space, away from the hustle and bustle can really help to get people to open up. People with mental health issues often feel like a burden. Open body language and kind words really can help. And above all everybody needs to remember that it’s okay to not be okay. Apprentices and other learners at tpm can always access support to help deal with any personal challenges they may face.